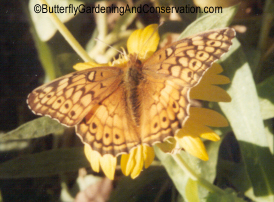 Variegated Fritillaries can be found throughout most of the US. Host plants are mainly Passion Vine (Passiflora incarnata) and Wild Violets (Viola sororia). Eggs are light greenish and laid singly on host plant leaves. 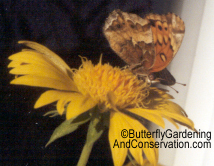 Adult from side, nectaring on Blanket Flower.